A British Bachelor Honours degree is placed at level 6 of the British national qualification framework, which has been referenced to level 6 of the EQF-LLL. An Irish Bachelor Honours degree is at level 8 of the Irish NQF, which has also been referenced to level 6 of the EQF-LLL. 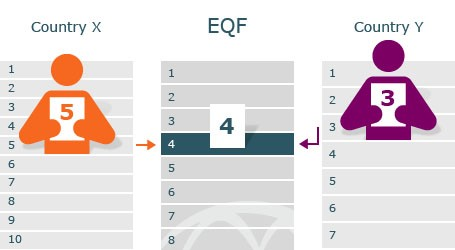 Therefore, if credential evaluators have to assess and compare these two qualifications, the use of the EQF-LLL can be useful in understanding their respective levels. How to place old qualifications (legacy awards) within a Qualification Framework? Credential evaluators should examine whether these qualifications are included in the national qualifications frameworks of the respective countries. If this is the case credential evaluators should take the level of the qualification as one of the important parameters in the final assessment. If the qualifications are not included, it should be established if other official documentation of the level of these qualifications exists and the assessment should be based on this documentation.